Edward Theodore Newell (1886–1941) was a U.S. numismatist. 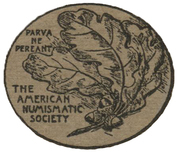 He served as the president of the American Numismatic Society between 1916 and 1941. Edward T. Newell, the ANS's longest-serving President and perhaps the greatest numismatist of his generation, was born in Kenosha, Wisconsin in 1886. He attended Yale University, from which he earned his bachelor of arts in 1907 and master of arts in 1909. It was during his tenure at Yale, that the young Newell — just 19 years old — first inquired in 1905 about membership in the ANS. By 1910, at the age of 24, Newell was elected to the Society's governing Council. In 1916 he was named ANS President, a position he would hold until his untimely death in 1941. During his lifetime, Newell was considered to be the world's leading expert on the coinage of Alexander the Great and his successors. And Newell's collection — with more than 87,000 coins — was considered to be the largest private collection of Greek coins. Upon his death, Newell bequeathed this mammoth collection to the ANS. It was — and still is — the largest single donation given to the Society. Newell was a prolific author. From 1912 through 1941, Newell published more than 30 monographs, and left behind numerous unpublished manuscripts. 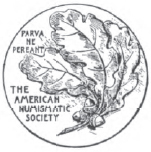 In recognition of his contributions to numismatic writings, Newell received the first Archer M. Huntington Medal Award in 1918. In addition, in 1925, the Royal Numismatic Society awarded him its medal for "distinguished service in numismatic research." 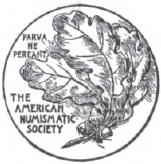 In addition to his association with the ANS, Newell also was a Fellow of the Royal Numismatic Society, the British Numismatic Society and the American Numismatic Association. He also served as President of the New York Numismatic Club in the 1930s. Upon his passing in February of 1941, The Numismatist declared that "[Newell's] numismatic life was an ideal which others may strive to emulate." Newell was only 55 years old. 1903 - 1909: Attended Yale, Yale University (Conn.). 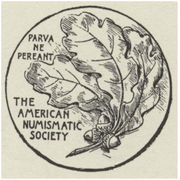 1925: The Royal Numismatic Society awarded him its medal for "distinguished service in numismatic research." Binder containing pages of notes on late civic coins of Alexander III of Macedon (Alexander the Great). Headings include Odessos, Callatis, Sinope, Aeolis, Myrina, Temnos, Cyme, Mylasa, Rhodes, Samos, Phaselis, Selge, and Aspendos. Binder containing pasted photographs and notes, along with loose pages of handwritten and transcribed typescript drafts, all on the coinage of Philip II of Macedon. The drafts include a forward, introduction, and a section on the predecessors of Philip. Binder containing pasted photographs of the obverse and reverse of ancient Greek gold coins showing Alexander III of Macedon (Alexander the Great) taken from sales catalogs. Includes some brief handwritten annotations. Binder containing pasted photographs of the obverse and reverse of ancient Greek gold staters showing Philip II of Macedon taken from sales catalogs. Correspondence, notebooks, invoices, card indexes, and photographs mostly relating to the collecting and scholarly research of American Numismatic Society president and Greek coin expert Edward T. Newell. Letter from Edward T. Newell to Alfred Bellinger, concerning cleaning the tetradrachms and denarii he received. Notebook binder containing a handwritten draft, mostly text, with the title Part II: The Posthumous Coinages of Lysimachus. There are several pages that have been typed from Newell's longhand notes. Includes one page of notes on Savoy-Plaza Hotel (New York) letterhead. Notebook binder containing a handwritten textual draft along with notes on coins grouped into categories. 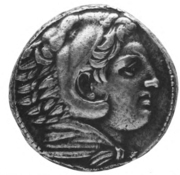 The text is an introduction to a general work on the mint attributions for coins bearing the name and types of Alexander the Great. The notebook has the label "Amphipolis" on the cover, which may refer just to the section on specific coins, while the introductory text was intended for the broader work. Notebook binder containing notes on coins in collections held in various places and by individuals: Athens, Alexandria, Berlin, Boston, Brussels, Cairo, Cambridge (McClean), Dresden, Empedocles collection (Athens), Florence, Allotte de La Fuÿe, Walter Giesecke, Gotha, Glasgow (Hunter), Hague, Kaftanzoglou, Kopenhagen (Copenhagen), British Museum, Lyon, Munich, Milan, Naples, New York (Metropolitan Museum), Bodleian Library, Oxford (Davidson), Charles Oman, Bibliothèque Nationale, Paris, Petsalis (Athens), Rome (Vatican), Rogers, St. Petersburg, R. Storrs, Pierre Saroglos (Athens), Turin, Vienna, Julius Werthem, Yakountchikoff. Notebook binder containing notes on coins of Indo-Greek rulers. Includes five loose sheets that are copies of pages on coins of Athens from another notebook. Notebook binder containing notes on coins of Lampsacus, Abydus, Tarsus, and miscellaneous ancient Greek locations. Notebook binder containing notes on tetradrachm coins from Pella, uncertain parts of Macedonia, and Peloponnese. An attached note indicates "prints not yet supplied for this notebook." Notebook binder containing notes, pasted coin photographs, and correspondence, all relating to various hoards of ancient Greek coins. The notebook was found among those of Edward Newell, but the contents do not appear to be attributable to him, some of which can be determined to have been created after his death in 1941. A label on the notebook spine indicates the contents to be related to Euboea and Histiaia, but they appear to have a wider focus than that. Headings include Eretria (1937), Euboeo-Boeotian (1950-51), Hoard 15 (Athens, 1954), AA Hoard, Artabi(?) hoard, Amandry (1963), near Larissa (1948), Newell's hoard, Preveza, Agora, Therianos (Noe 1104), Noe 629, and Zenikeni (circa 1903). Some pages have a substantial number of missing coin photographs. The correspondence (1951-1952) consists of about seven letters to Professor William Wallace, Department of Classical Languages, the University of Toronto. The correspondents are the dealers Roy Baldwin at A.H. Baldwin & Sons, and Leonard Forrer at Spink & Sons, and the letters relate to a Euboean-Boeotian find. Notebook binder with notes on ancient coins of Cyprus, Syria, Phoenicia, Babylon, Alexandria, and the East. Includes some loose items relating to Babylon and the Euphrates, including two maps, a magazine offprint in German, and a hand-drawn sketch. Notebook binder with preliminary notes and drafts for the monograph The Coinage of the Western Seleucid Mints (ANS, Numismatic Studies no. 4, 1941). Focuses on the coinage of the successors of Alexander III of Macedon (Alexander the Great). Headings include Tyre, Cilicia, Seleucus I, Antiochus I, Antiochus II, Seleucus II, Seleucus III, Achaeus, Magnesia ad Maeandrum, Phocaea, Aeolis, and Troas. Has pages of handwritten draft text with corrections and some sections crossed out. An added label on the cover says, "E.T. Newell's preliminary notes for W.S.M." Notebook binder with preliminary notes and drafts for the monograph The Coinage of the Western Seleucid Mints (ANS, Numismatic Studies no. 4, 1941). Focuses on the coinage of the successors of Alexander III of Macedon (Alexander the Great): Antigonus, Seleucus I, Antiochus I, Antiochus II, Seleucus II, Seleucus III, and Antiochus III. Includes draft text with corrections and entire sections checked off and crossed out. Notebook containing handwritten notes on Indo-Bactrian and Scythian coins from various collections. Contains numerous footnotes documenting in which collections the coins could be found. Headings include Bactria, Early Imitations of the Issues of Euthydemus, Sogdiana, Greek Kings in Paropanisadae, Greek Kings in Western Gandhara, Greek Kings in the Eastern Panjab, Partho-Scythian Rulers of Eastern Persia and North-West India, Partho-Scythic Rulers in Arachosia, Partho-Scythian Kings in Gandhara, and Indo-Scythian Kings in Gandhara. There is a six-page, typed and corrected text draft on Cyprus. Three pages of what appears to have been typed text have been ripped out (in Azes section). One loose sheet is headed "King of the Salt Range Sophytes." Notebook containing handwritten notes on ancient Greek coin collections at Cambridge and Oxford Universities. Includes those of Frank and John McClean, William Martin Leake, and Samuel Savage Lewis. Notebook containing handwritten notes on ancient Greek coins at the British Museum, London. The names C.W. Oman and James Leigh Strachan-Davidson, master of Balliol, appear in the first pages. Four loose sheets of rubbings are included. Notebook containing handwritten notes on ancient Greek coins at the National Archaeological Museum (Ethnikon Archaiologikon Mouseion) in Athens, Greece. Notebook containing handwritten notes on ancient Greek coins in Dresden, Germany. Notebook containing handwritten notes on ancient Greek coins in museums of Turin, Italy, and The Hague, Netherlands. First page refers to the book Regio Museo di Torino (Royal Museum of Turin), Stamperia Reale della Ditta (Royal Printing Company) G.B. Paravia, 1988, by Adriodante Fabretti, Francesco Rossi, and Ridolfo Vittorio Lanzone. Notebook containing handwritten notes on coin finds at the ancient city of Susa in Iran. Notebook containing notes on coins at Berlin. Notebook containing notes on coins at Berlin. Label taped to cover says "Berlin (1)." Notebook containing notes on coins at Berlin. Label taped to cover says "Berlin (2)." Notebook containing notes on coins held by the Bodleian Library at Oxford University, England. Notebook containing notes on coins in Italian collections: Naples, Rome, Taranto, Florence, Venice, Milan, and Turin. Notebook containing notes on coins in United States private collections: Clarence S. Bement, Jeremiah Zimmerman, George A. Gillette, and George J. Bauer. Notebook containing notes on coins in Yale University collections, including Adana Museum, Dura excavations, and the University Collection, as well as coins from Seleucia excavated by the University of Michigan under the direction of Robert H. McDowell and held by the Kelsey Museum of Archaeology. Notebook containing notes on coins of Alexander the Great and Cassander at Paris. Notebook containing notes on coins of Alexander the Great at Berlin. Notebook containing notes on coins of the M.C. Soutso collection. Notebook containing notes on coins of various hoards, along with loose leaves with additional coin lists, notes, and rubbings. A detached label once adhered to the cover of the album reads, "HOARDS II." Includes a letter to Margaret Thompson from Martin Price of the British Museum relating to a joint project on the coins of Alexander the Great (1968). Hoards covered in the notebook are Sardis, Anadol, Aleppo, Ankyra, Aintab, Andhritsena, Abu Hommos, Taranto, Bithynian, Demanhur, Chalcis (Eretria), Calabria, Constantinople, Cyprus (Larnaka), Peloponessos, Drama, Greece (Tiffany), Eretria, Epidaurus, Sparta, Patras, Gesou, Haiffa, Prof. Haynes, Saida, Jandolo, Anadol, Kuft, Kyparissia, Keleler, Karditsa, Messene, Larnaka, Lamia, Latakie, Mosul, Marasesti, Patras, Parthian, Philip II Staters, Ravel, Salonica, Sophikon, Taranto, Tripolitsa, Thebes, Urfa, Gejou, Lamia, and Kyparissia. Notebook containing notes on six coin collections of Massachusetts: Massachusetts HIstorical Society, F.M. Endicott, R. Faelton, Harvard College, Museum of Fine Arts, Hartford (Morgan Memorial). Notebook containing notes on the mints at Antioch, Ake-Ptolemais (Acre), Ascalon, Berytus (Beirut), and Damascus. Includes loose notes, some on letterhead of the R.M.S. Mauretania, the Hotel Russell (London), and the Plaza (New York). There is one letter, to Newell from Charles William Chadwick Oman at Oxford, regarding a tetradrachm (October 23, 1937). Notebook of handwritten notes and pasted photographs of ancient coins of Gallic tribes. Includes Tr?sor d'Auriol, Marseilles, Massilia, Gallo-Etruscan, Rhone Valley, early imitations of the Philip Stater, Basin of the Garonne, South-West Gaul, Central Gaul, Arverni, East-Central Gaul, Aedui, Sequani, West Gaul Petrocorii, West Central Gaul, Bituriges, Pictones, Santones, Carnutes, Cenomani, Aulerci-Cenomani, Armorica-Namnetes, Amorica Ossimii, Baiocasses, Coriosolitae, Redones, Aulerci Diablintes, Aulerci Eburovices, North-West Gaul "Gallia Belgica," Atrebates, Veliocasses, Ambiani, Bellovaci, Parisii, Meldi, Remi, Senones, Suessiones, Lingones, Leuci, Gallia Belgica Nervii, North Gaul "Gallia Belgica," Treviri, North-East Gaul, Virodunenses, Mediomatrici, East Gaul or Helvetii, Valley of the Rhine, Rauraci, Helvetii, Salassi, ring money, Rouelles, Ancient Britain, South Eastern District, Tincommius, Verica, Tasciovanus, Cunobelinus, Iceni, Brigantes. Notebook of handwritten notes on Greek coins from private collections, at least a portion of which appear to have been purchased or otherwise obtained by Edward Newell or the American Numismatic Society. There are several letters from the owners of the collections. Includes the collections of H.E. Mitchell, Charles C. Torrey, George F. Curtis, T. Biddulph, R.B. Whitehead, M. Martino, Selah Merrill, Lyman Otis Fiske, Costa Pandelidis (Apostolidis), and Sally Isenberg. A loose copy of a memorandum to Newell from an ANS staff member discusses the purchase and condition of the Augustus F.R. Hoernle collection on February 7, 1920. Notebook of handwritten notes on ancient Greek coin hoards, including Aleppo, 1893; Afiun Kara Hissar, Arpagot, 1918; Adrianople; Asia Minor, 1929; Babylon, 1900; Byblus, 1931; Chalcis, 1935; Chalcidice (Olynthus? ); Demanhur, 1900; Epidaurus, 1903; Gebal (Byblus), 1931; Homs, 1934; Homs, 1927; Khorsabad; Mesopotamia (Dunne); Nicomedia (probably Thessalian hoard); Tell Halaf, 1911; Thessalian, 1938. Also, one loose sheet of Pera Palace Hotel (Constantinople) letterhead containing four pages of notes labeled "Antioch" Hoard. Notebook of handwritten notes on ancient Greek coin hoards, including: find of copper coins of Theodosius, Gratianus, etc. ; find of copper coins from Egypt, Constantine, "Hassan Find" I ("sent me by Hassan Abd-El-Salam, Sept. 1909"); hoard purchased from Nahmy E. Homsy ("a well known Syrian dealer in antiquities, residing in Brooklyn, N.Y."); part of find of second bronze from Egypt ("sent me Sept. 1909"); part of a find made near Luxemburg ("time: Constantine Great"); part of find from Ras-Hauran, Syria ("bought of Azeez Khayat who states these were found by Salih Hamauti [?] at Beit Ras Hauran"); part of find of Roman Antoniniani ("sold by Thomas L. Elder, Oct."); find from Italy; two lots of potin tetradrachms from Egypt; and portion of a hoard of Athenian tetradrachms ("sent me from Euboea, via Athens, Jan. 1929"). Includes two loose sheets of rubbings of medieval coins (Leon III, Constantine V, Justinianus, Tiberius, Theodosius, Tiberius V, Artemius, Anastace II, Filepicus, Bardanes and one loose sheet labeled Hoard Purchased from Nahmy Homsy. Notebook of handwritten notes on ancient Greek coins. The label "Uncertain" appears to have been added later, indicating that the coins, which include the categories and types Philip II, Staters, Tetrobols, Head and Horseman, Alexander, and Eagles, are from an unknown collection or collections. One page notes "new acquisit[ions]" and another page has entries on two coins under the heading [B.M.] Yakountchikoff. Notebook of handwritten notes on the private and provincial ancient Greek coin collections of Robert Jameson, Th?odore Reinach, Seymour de Ricci, Claudius C?te (of Lyon), Jules Rouvier, and Fran?ois-Maurice Allotte de La Fu?e of France. Notebook on coins from private collections of Great Britain: A.H. Baldwin, Edgar Rogers, S.G. Robinson, and Spink & Son. Baldwin entry is dated November 1921 and says "Hoard from Taipoli in Peloponnesus," with the added note "probably Tripoli - Tripolitsa." Includes notations (ETN) indicating Newell coins. Notebook with notes on coin collections in the United States and Toronto, Canada. Includes Draper (New York Public Library), U.S. Mint, Princeton, Toronto (Royal Archaeological Museum, Hammer, Bement, Yale, E.P. Robinson, and H.A. Greene (Providence). Image shows Edward T. Newell as a child posing with a dog. Image shows Edward T. Newell as a child. Image shows Edward T. Newell as a young child in a naval uniform. Image shows Edward T. Newell as a young child wearing a German military uniform. Image shows Edward T. Newell as a young child wearing a hat. Image shows Edward T. Newell as a young child. Image shows Edward T. Newell at the time he was beginning his studies at Yale University. Letters and other materials relating to the presentation to the ANS of a satirical medal to honor an unknown attacker of Senator Huey Long of Louisiana. Photograph of Edward T. Newell as an infant with his mother, Frances Bain Newell, and sister, Moyca Newell. Photograph of The Bain Wagon Company, the Newell family business. It was established by E.T. Newell's maternal grandfather. Pictured in the photograph (left to right): Edward T. Newell, Prince of Wales, Prince's Equerry, John Flanagan (sculptor of the medal), William Gilman Thompson and Henry Russell Drowne. This image shows E.T. Newell at the time of his graduation from Yale University. This image shows Edward T. Newell at about the time he endtered Yale University. DRAFT OF AN INTRODUCTION TO A PROJECTED STUDY OF THE COINAGE OF ALEXANDER THE GREAT, INTRODUCTION, Demeter (No. 36; Pl. XII)., Youth with Fillet (Nos. 43–57; Pls. XIV–XV).